Daughter made a leek and potato pie tonight. We are just about to eat it! Hubby makes a leek and potato soup that is HEAVENLY! !Hope DD's pie is great!!Enjoy! It has leek and potato, and rosemary, and cream cheese. I am prepared to enjoy! Ok, now I want in on that recipe! Not really a recipe. She cut up a big leek, and fried it in butter with potato bits and then put it all into pie crust with clumps of cream cheese. Baked it. That is all, really. We had chicken thighs along with it, but really the pie needed no company. It was that good. 4 of us had some and there is still half left. It will be better tomorrow with a night to rest itself. It is a fall winter thing. Yum! I shall have to do that soon. Yum! Sounds delicious :) I love leek and potato anything! Mmmmm! My husband makes a leek-potato soup as well but I am unfamiliar with these things in pie form. 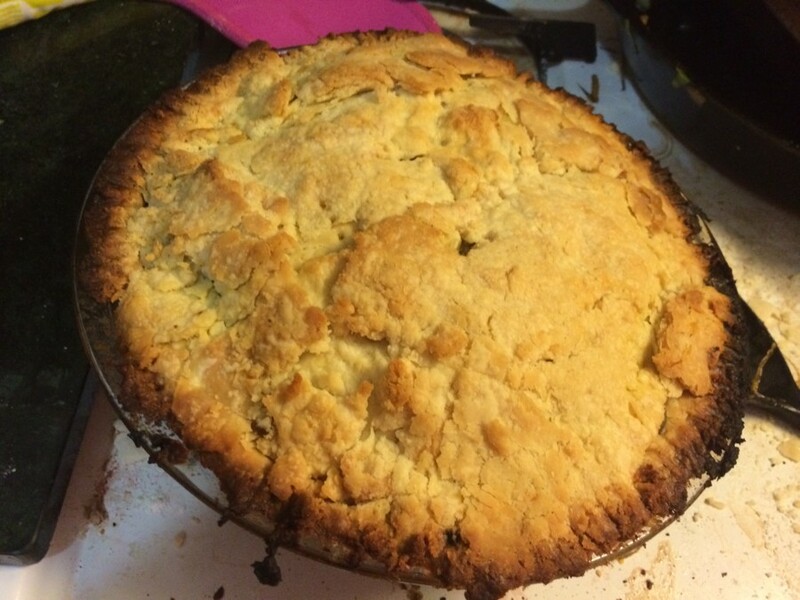 Just about everything is better with a good pie crust, I think I shall have to request one of these the next time we get a big leek in our farmshare box. I don't put pie crust on my leek and potato pie; I cook the leeks and add a creamy bechamel sauce (I use 'light' cream) and covver it with mashed potato and a sprinkling of parmesan. another nice dish is wrap a slice of ham round each cooked (but not overcooked) leek, cover in a cheese sauce and bake in the oven. I've never had a leek and potato pie, but that sure does look (and sound) good! How was it? imagine it went very swiftly after the photo was taken..